We have had a great weekend …. It’s been a good busy though. I am excited to finally feel like I am getting back into the swing of writing again. So this morning I will be linking up with one of my favorites. 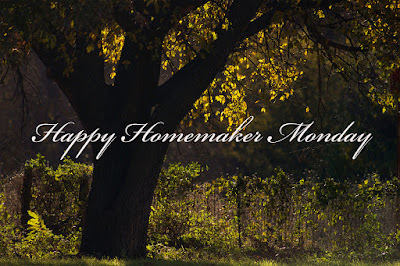 Happy Homemaker Monday, with Sandra at A Diary Of A Stay At Home Mom. Follow the link and join in on the fun! It’s going to be a very wet week here …. However I will welcome the cooler temps! As I look out the window…. I am sure the ground will gladly receive every drop that falls gladly. Toast , yogurt, and a cup of coffee in my new favorite cup….. I decided to reread One Thousand Gifts by Ann Voscamp, when I noticed I was struggling a bit …. I don’t really have a series at the moment…. Make sure London our puppy has all she needs when her sitter comes to stay with her. Today I have a trip planned to American Girl with one of my sweet princesses from church. We will be having a birthday lunch in the bistro. She is so excited. We have a really busy week this week. I see a new lung specialist on Thursday. We are trying to understand why I still have to sleep setting straight up…. I will be preparing for us to go out of town for revival that my hubby will be preaching. I need to get all this done before Friday…. I have a benlysta infusion on Friday and it tends to wipe me out for several days. I had missed it till I began again. I really need to begin working on Christmas presents. made this and two more for my a little girl at churches Birthday last week. What am I wearing …. One of my simple pleasures…. Taking care of my home…. When you lose what used to be your very normal life…. You find a new normalcy… I enjoy the things I haven’t lost… I love to take care of my family. Favorite Bible Verse, devotion, or quote…..
For my hubby as he prepares for revival. We pray that lives will be changed. Sounds like you're going to have a very productive week. Those doll clothes are so cute. My grams used to make all of mine and I still have many of them with fond memories. Someday your little girl I hope will have the same memories. Enjoy the cooler temperatures and your trip. Thank you for stopping by, and for your kind words! My friend actually has one of the Chrissy dolls at her house on display! she is such a pretty doll! Hope you have a great week! Not sure if it's on my end but some of your post kept cutting off the sentences. Mondays are always better if they follow great weekends. Cute coffee cup. Hope you have a wonderful week! Jean thank you for telling me about the sentence cut off! I was able to go in an fix the issue! Thank you for stopping by! Hope you havae a blessed week! I LOVE that mug!!! And that dress is beautiful, reminds me of Moana! You have a beautiful centerpiece, you're such a crafty person :) I love you so much, and I'm praying for your doctor appointment, and I am praying so hard you and Christian feel good next week. I need some Vitamin Sea with my best friend in the worst of ways. I love you! Thank you my sweet friend! I cant wait for some vitamin sea with my bestie! I just need some time with you in the worst ways! I love you mostess and I am praying for you! Grab Some Tea and Lets Catch Up!